Hello guys what’s up, how’s recycling thing going on at your side? 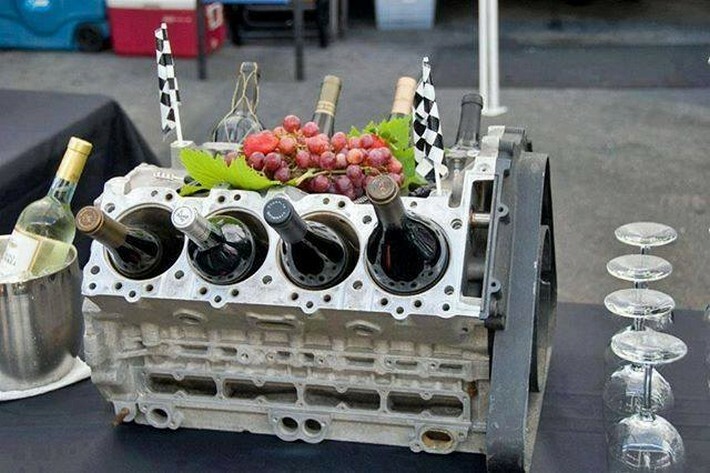 Well, let me remind you guys that it has been so long we are experimenting with several recycling ideas. 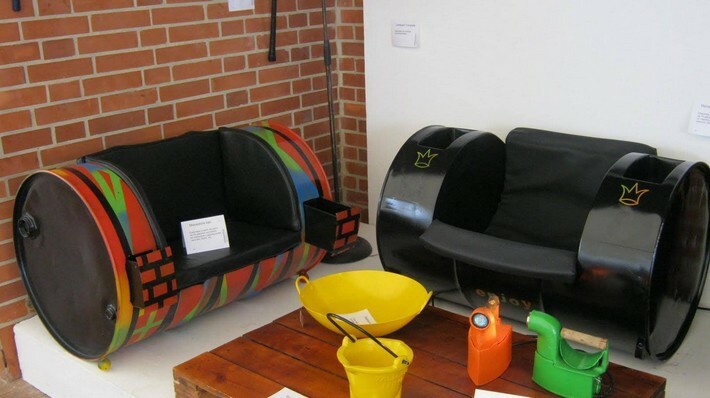 We have literally recycled each and every stuff like we have made countless wooden furniture items with wood pallet, we have surfed the old tires, pvc pipes, cable reels, concrete slabs etc etc. This is a long list of accessories that are upcycled. 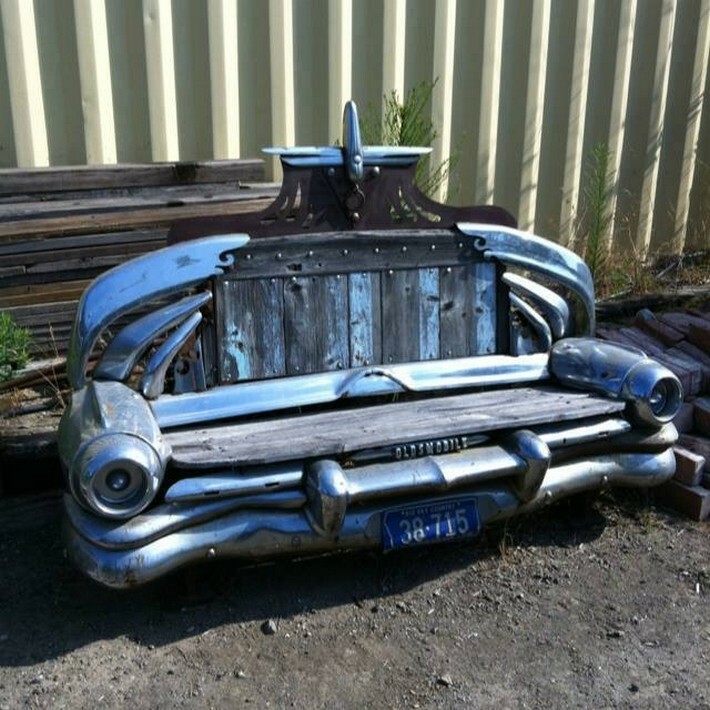 Here we have come with a relatively expensive but incredible idea where we are going to recycle various vintage cars. Parts of them would be turned in furniture items and many other accessories would also be recycled here. 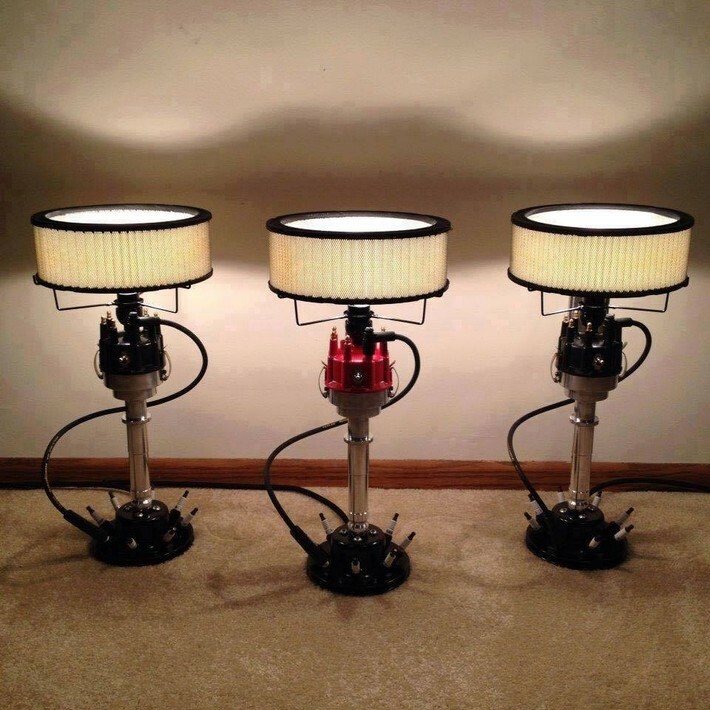 I am beginning with this antique vintage ford having some of the finest head lights. But as we aren’t concerned with the lights at this time, we have turned it into a great black couch. These vintage scooters remind me of the good old days when heavy bikes and choppers weren’t that much in fashion. 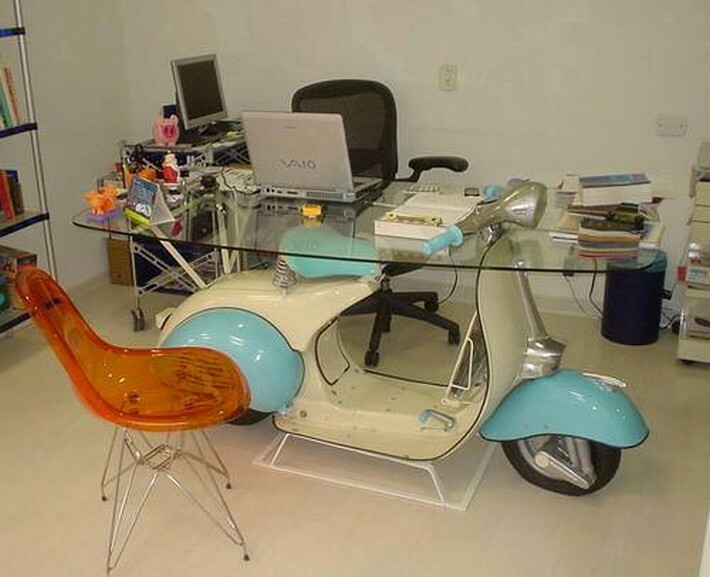 These scooters were meant to be among the most economical conveyances of that time and just imagine it is still benefitting us as we have used it as a the whole base of a glass top office table. Do you see the roughness and rawness of the wood here? Well, this was certainly meant to be this way. 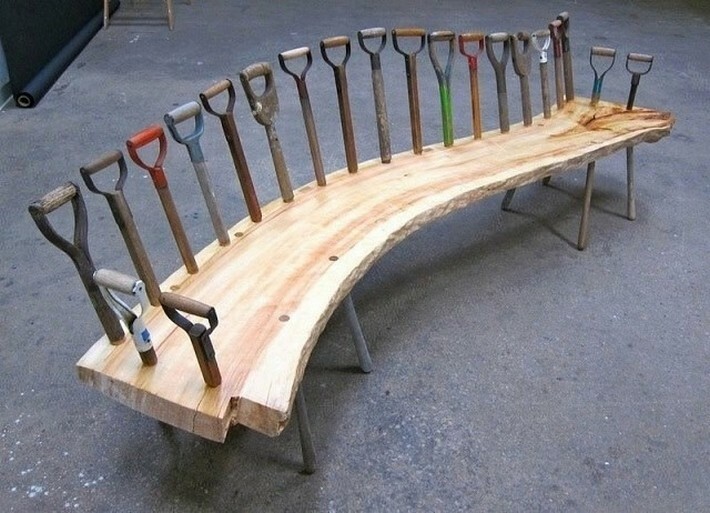 And guess what we have used in making the back of this crazy raw wooden bench? We have used the wooden handles used in the multiple tools that are used for picking sand and soil. I am sure you guys have already figured out that this metallic base is actually the base of an old sewing and embroidery machine that was in use in late nineties. Now it was pretty useless so we just grabbed it and we fixed a bath tub or sink on it. While this one seems like a horribly old vintage car that was already in shambles. 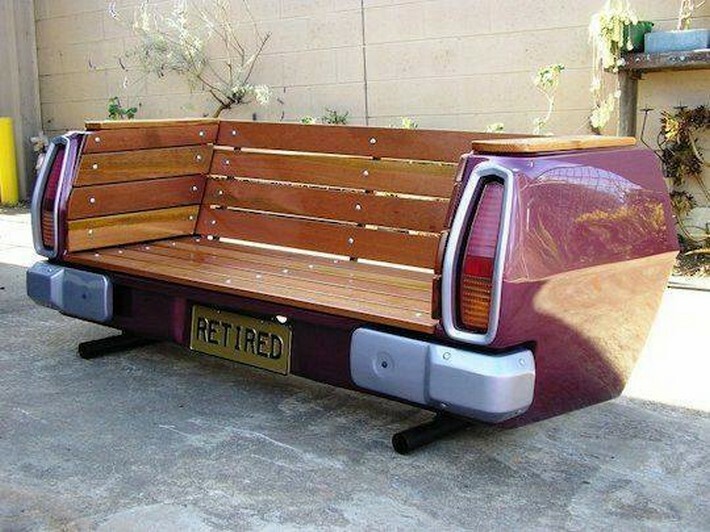 But we have done something outstanding using this car portion, we have installed a wooden slab all along the length making it an outdoor bench. I am really in love with these vintage cars. Trust me I didn’t want to cut them like that but we really had no choice left with us. 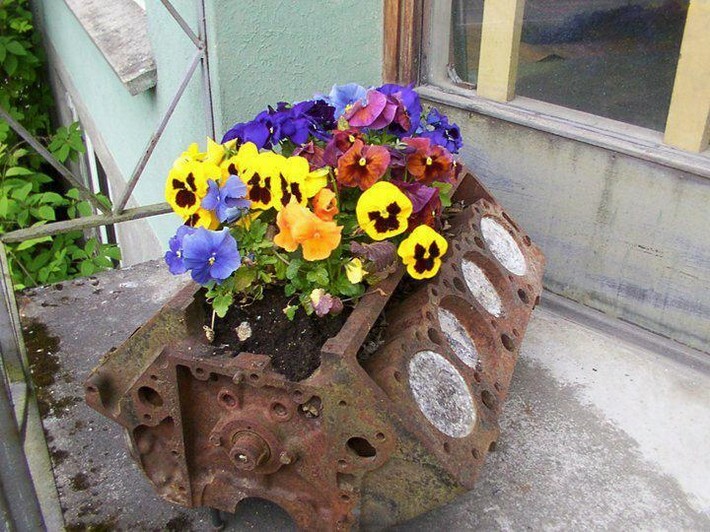 As the cars were irreparable so we just thought that instead of just trashing them away we must recycle them in this way. This is the back of a four wheel drive wagon that was used for a pretty long time. And even at the end we didn’t like to waste them and we made this outdoor sitting couch by adding some wooden slabs and the idea really worked. And this jeeps reminds me of the big roaring machines or jeeps that are frequently seen on discovery and national geographic channel while encountering the beasts and predators. But just look how softer touch we have given to this scary roaring machine by turning it into a decent wall décor idea. Not necessarily we have used mere vintage cars but we have also used some relatively fresher cars. 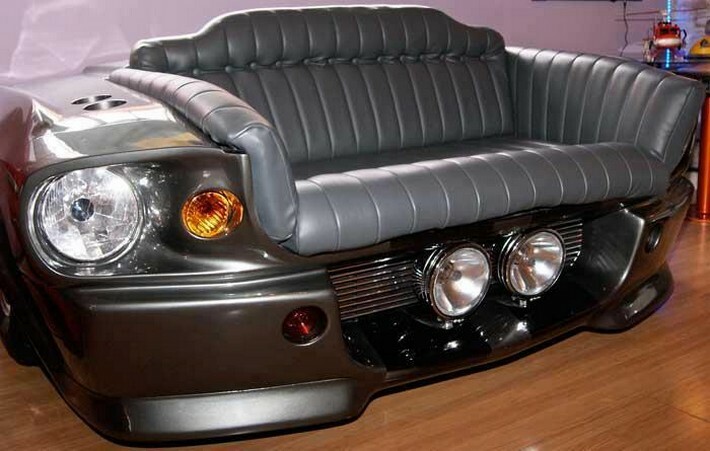 You must be aware of the craziness of some fanatic crafters who are ready to go all miles in the pursuance of their passion as here this pretty expensive car which was trashed is turned into a smart couch. So far we have mostly used some car related parts and the cut portions of the whole cars. All of the ideas were just spontaneous trust me, we really had not done any prior home work for them. Just picked up the tools and started recycling projects. 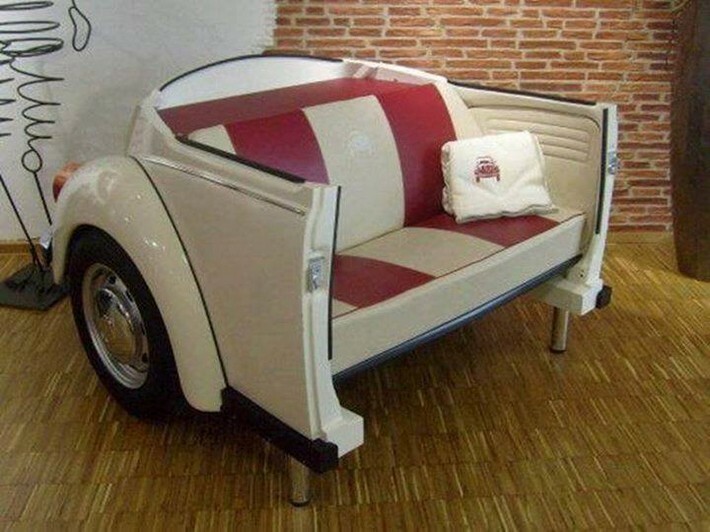 This couch is also a pretty considerable one as it is made with the back of a small car called foxy that was in use in late eighties and now we see it rarely. But we really had to do some fine polishing on the metallic frame and the tail lights to make them shine. While this one is so smart. It seems like a the whole front of the car is cut into half and grabbed out here. 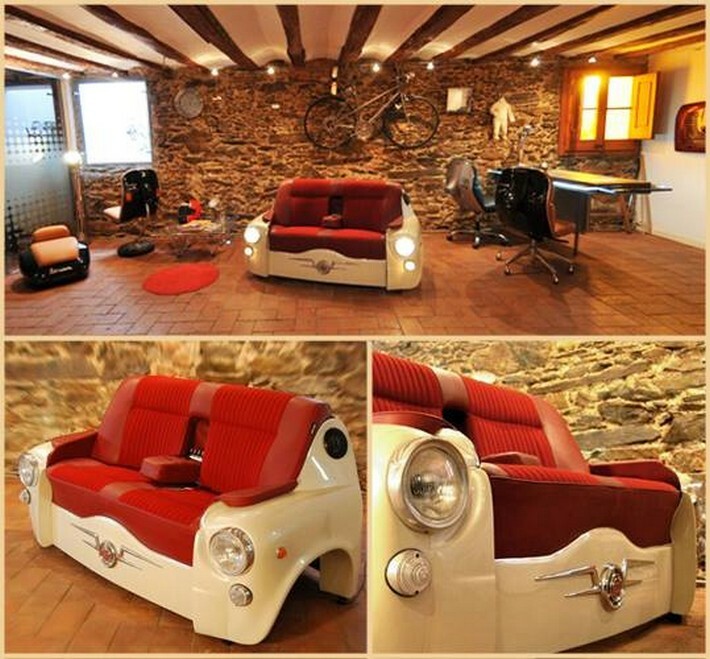 The sitting space is so damn luxurious and also stylish as well. And the combination of cream shade with the red has even escalated the beauty. I am more than sure many of the youths won’t be aware of this metallic rim. This seems like one from the bikes but actually this belongs to a vintage car. The earlier cars had frames similar to this one. 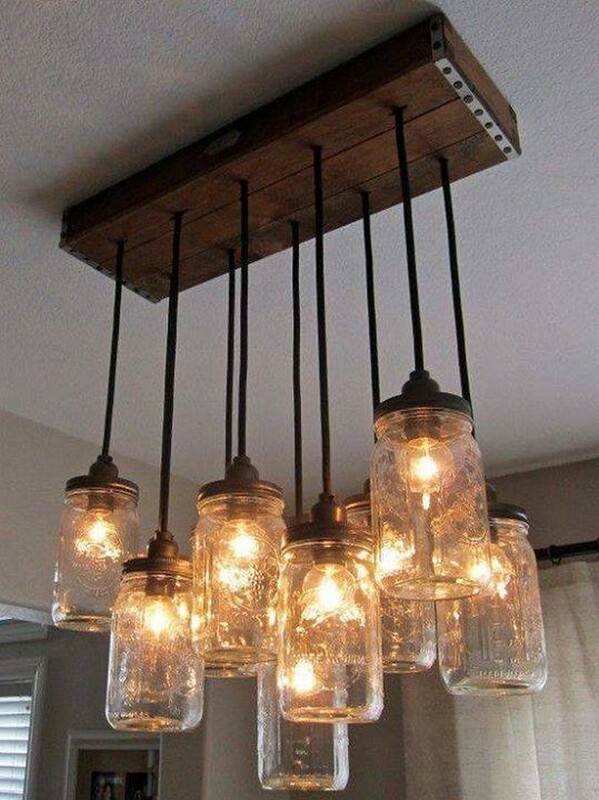 And making this room chandelier was also fun as all the things or accessories that we needed in the process were all available at our very own place, these glass mason jars were lying in the backyard in bulk, while the rest of the frame was reclaimed from an old chandelier. These ordinary art crafts are all made out of the cheapest accessories which we have had denied totally or we had trashed them. But here in these projects we have given some new life to all of these dead objects which were no more in use anymore. 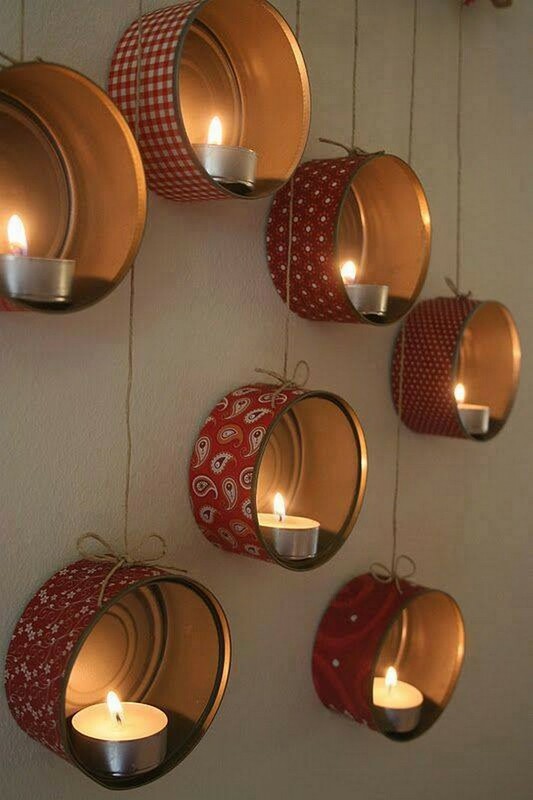 Just like these candle containers. 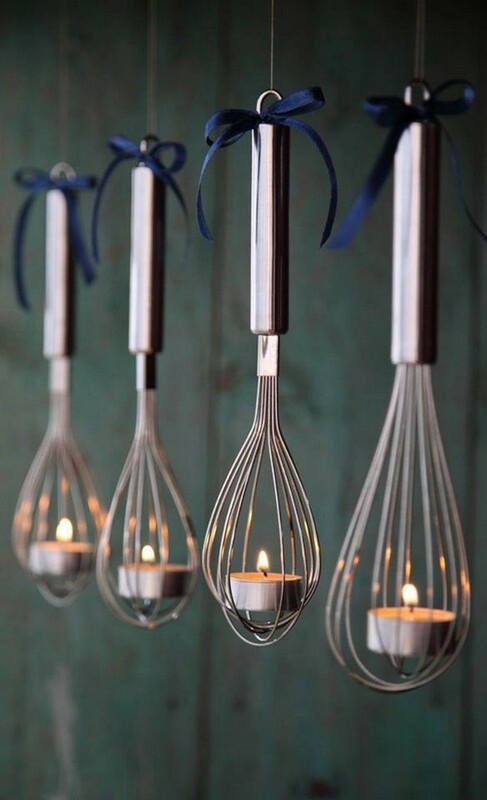 Wow, I really adore the crafter who created this idea like who on planet earth would have ever thought that these mere kitchen accessories whom we call beater, are going to become a smart candle container. Look at their cost and the final product that we have made out of it. 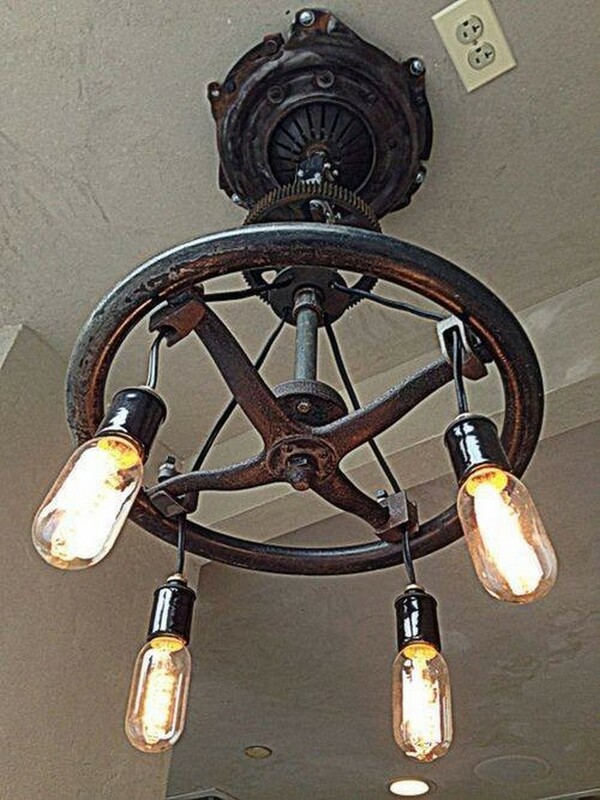 This industrial chandelier is not an ordinary one as we can see that the steering of the vintage car is used as the base of the chandelier. And right below that we have installed some common Edison bulbs. This reflects your aesthetic sense and fondness of art crafts. Wohooo… hang on man, I am bit confused with this one. 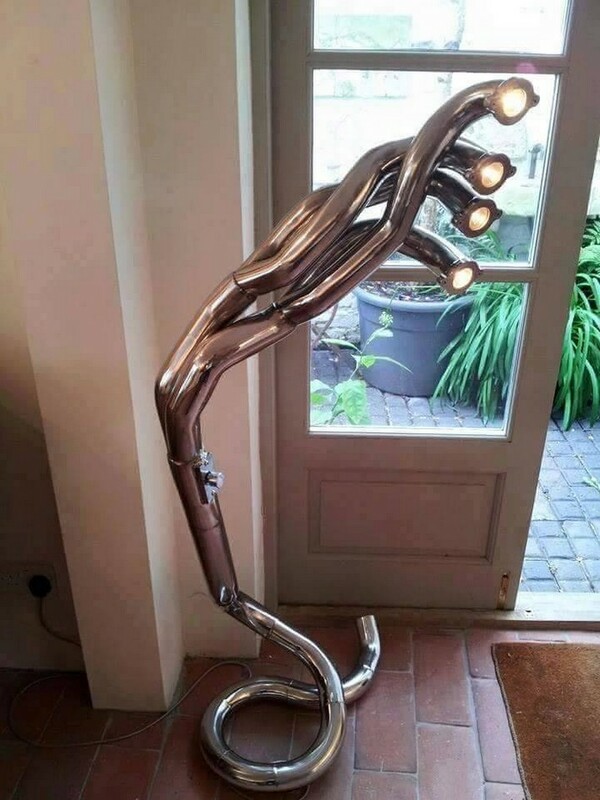 Seems like some gas related installation but not exactly, this is a table lamp that is entirely made suing the old iron made pipes that we use in water supply. This is crazy man, simply crazy. 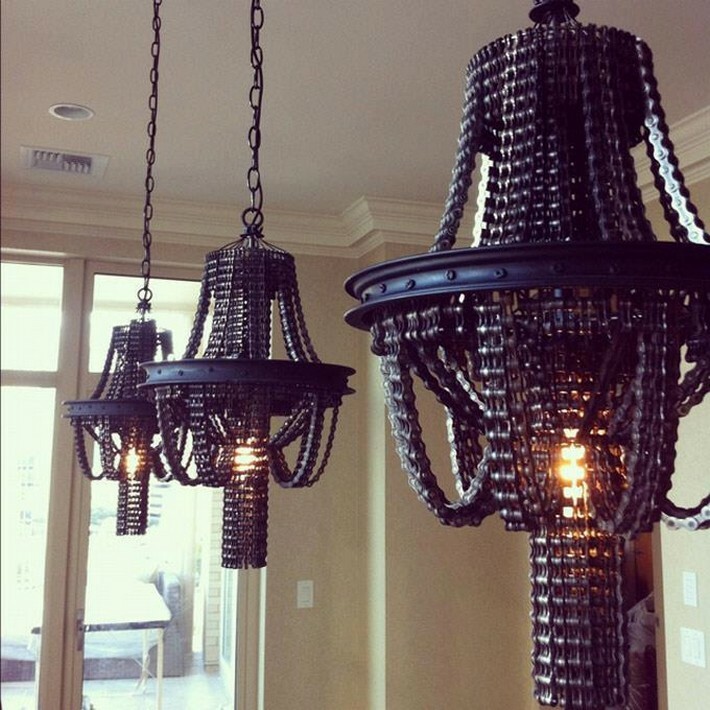 These elegant chandeliers are again made with some discarded parts of the bicycles. 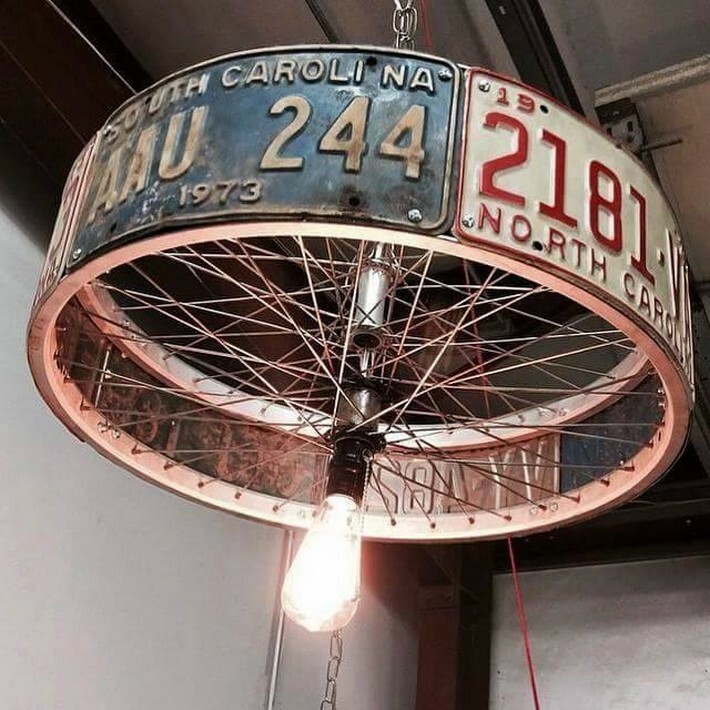 I know it apparently seems like some expensive market based chandelier but focus on the metallic wheels, they are actually the bicycle rims, and all around them the cycle chain is wrapped making it look like a perfect lighting installation. What? I mean really? 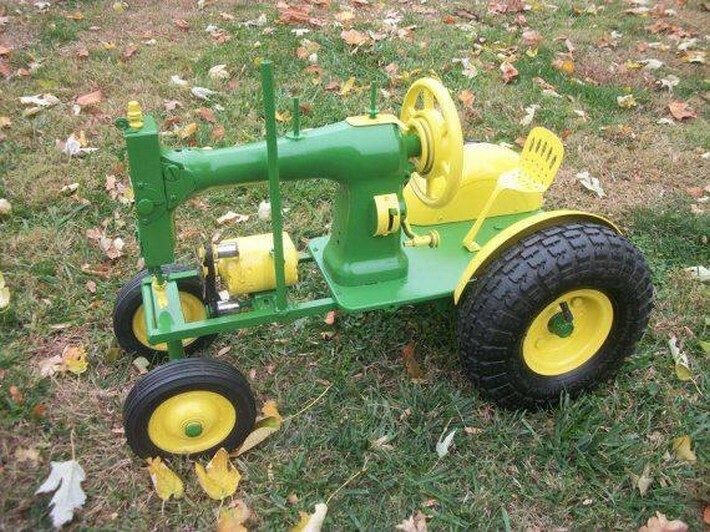 This one really made me laugh out loud man, I am just confused whether it is a tractor or a sewing machine. 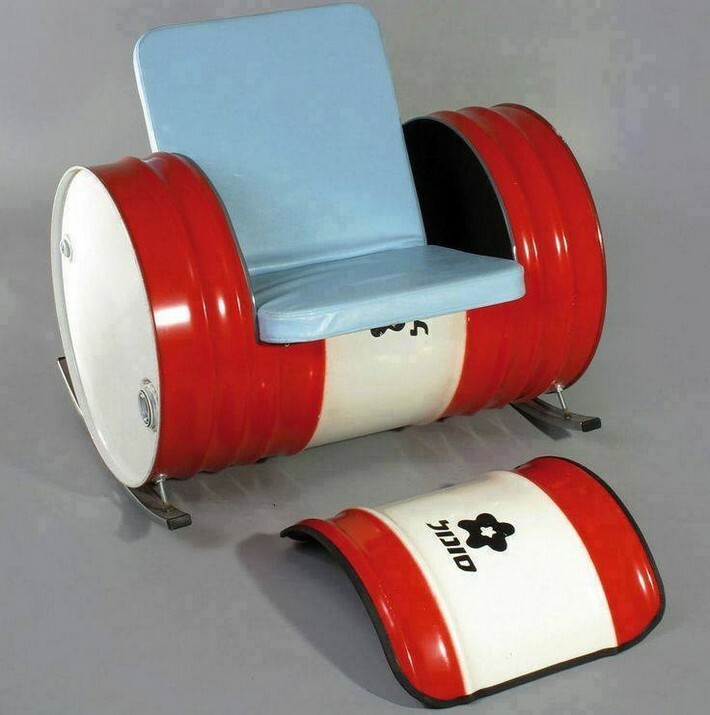 It has also got a chair on the front where may be the tailor would be seated. But actually this is a caricature or a mere decoration piece. Do you remember the old scooters one of which we have already recycled in some earlier projects. Here we have disassembles the whole front light along with the handle and we have placed it just like a table lamp here. 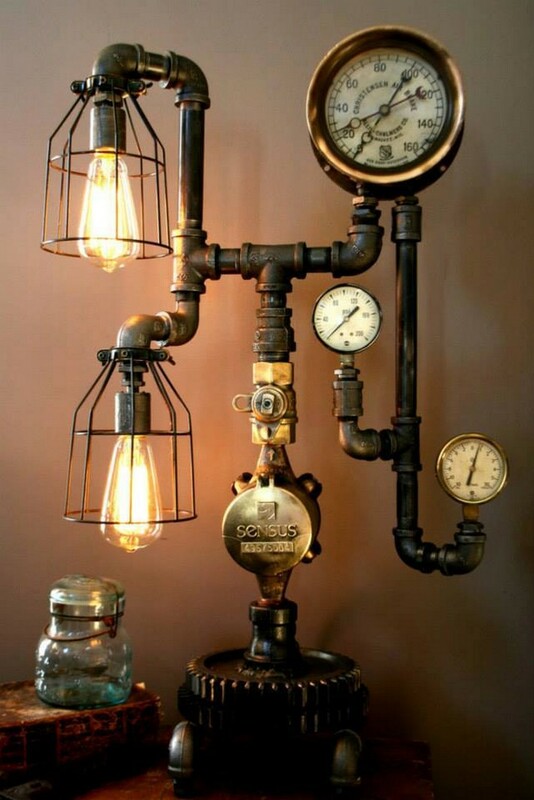 This antique lighting installation would really make an impact. I am sure you guys are familiar with this metallic drum or barrel or whatever you call it. It was a really hard project as cutting the sheet out of this thick wrought iron made barrel. This really takes some strong nerves to deal with this kind of hard material. Now I want to guys to guess what exactly this thing is? Ok don’t get choked up guys and let me help you out. This is the silencer of the motorbikes that is an integral part of the bikes. But you have to adore our talent who have made into this smart art craft. Okay, here comes something that might look nasty and stinky to some, but actually this is a very smart planter that we have placed in the patio. This is the engine frame of a vintage car that was halted and trashed. 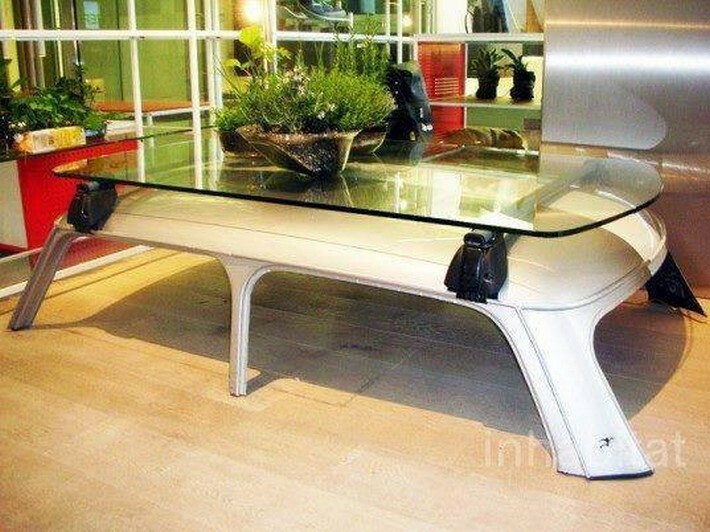 Again you have to ponder upon the structure of this distinguished wooden table with a metallic frame. 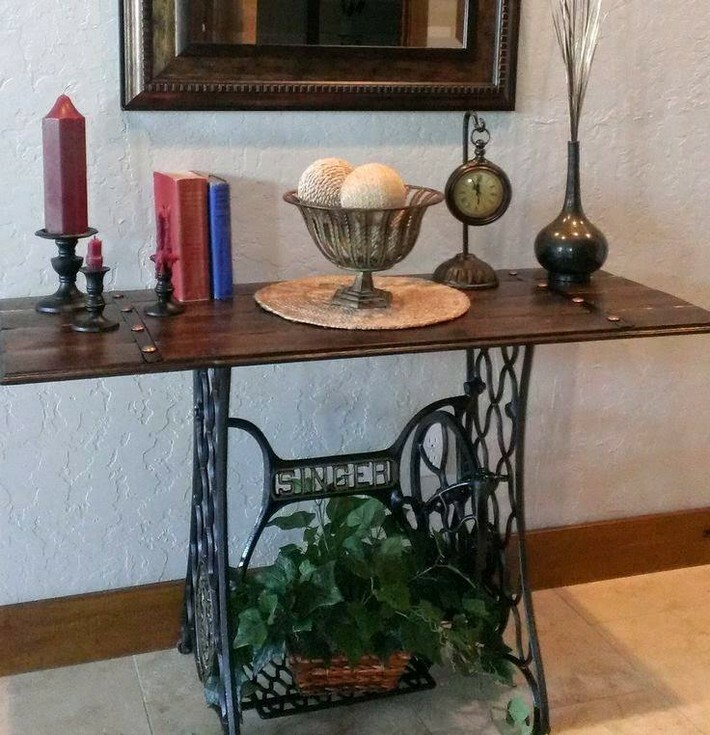 This metallic frame belongs to an old sewing machine that was out of order, so we just grabbed this heavy metallic frame, stained and shined it nicely and turned it into this smart table. 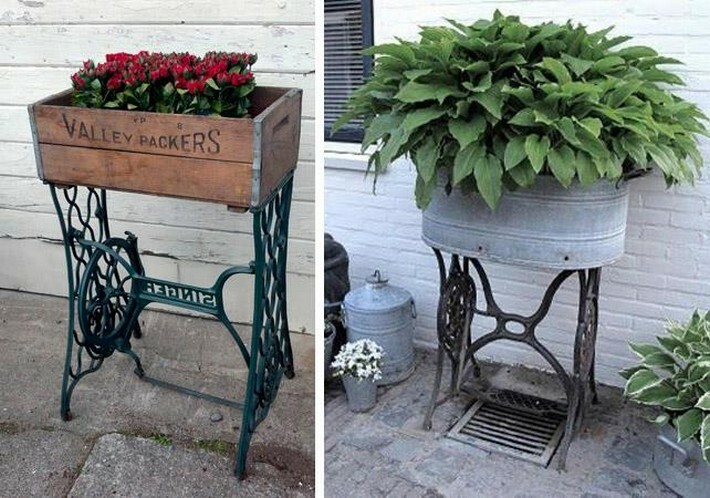 These planters are again made using the same sewing machine metallic stand. In one of the pair we have used the wooden fruit crate on the top, and in the next one a simple metallic basin is placed for being filled with the clay, and they really look amazing lying in the patio or garden. Seems like we are roaming around some gas station right? 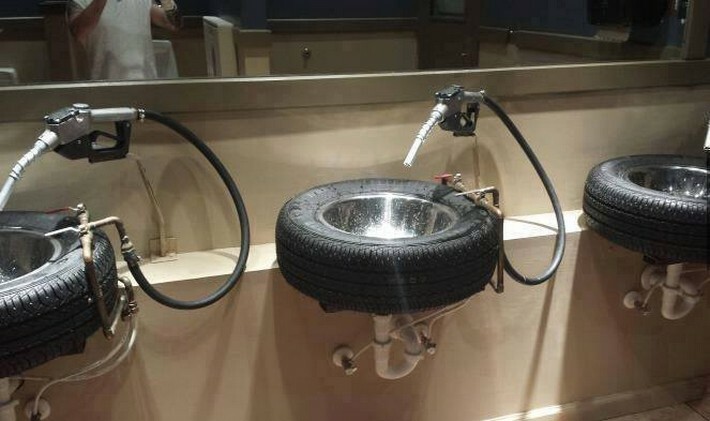 But don’t be astonished at all, these bathroom sinks are made with the old tires along with the rims. 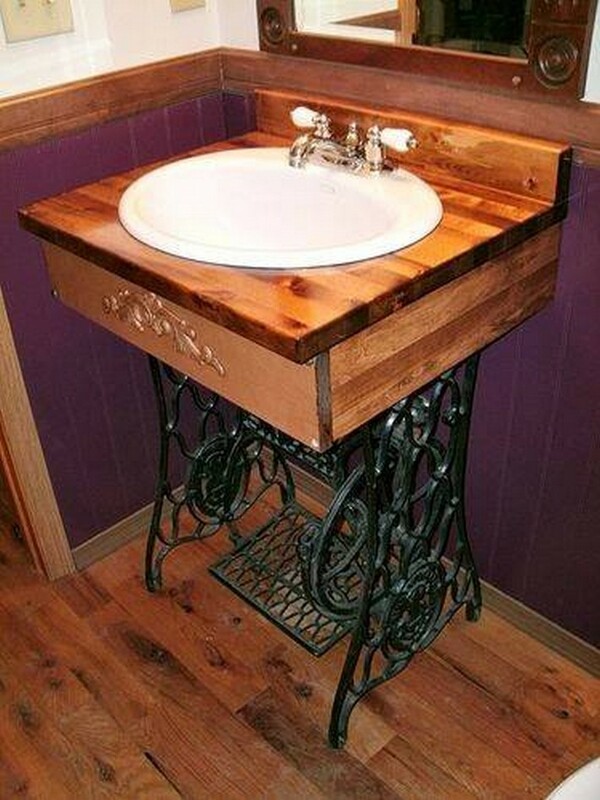 This is just a new dimension of the décor plans. They are more durable and long lasting. Almost all of us have these metallic drums in our patio. They normally carry some chemicals or some other materials that are also used on construction sites. 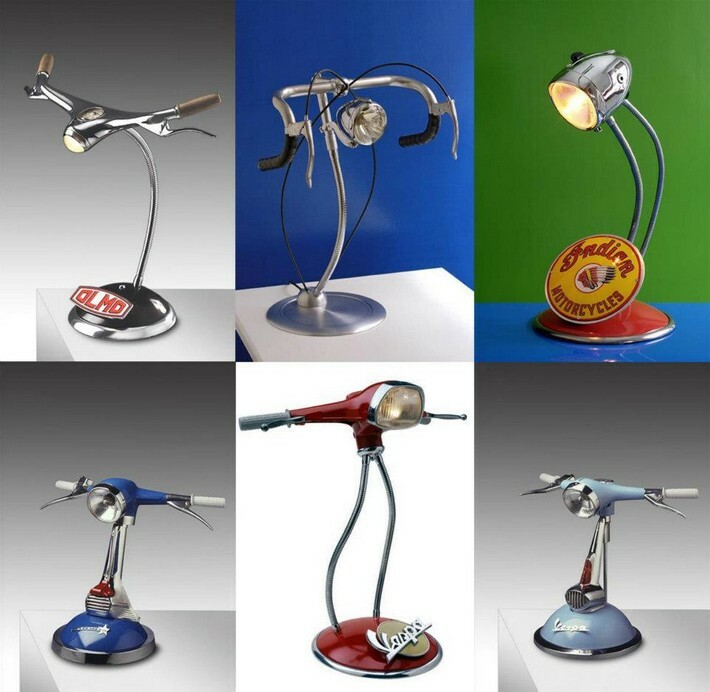 Here we have turned them into some very cute ideas that are most appropriate for the kids or school going teens as they are flooded with eye catching shades. My goodness, even I hadn’t thought this much crazy idea is going to be applied on these home crafts in such an insane manner. 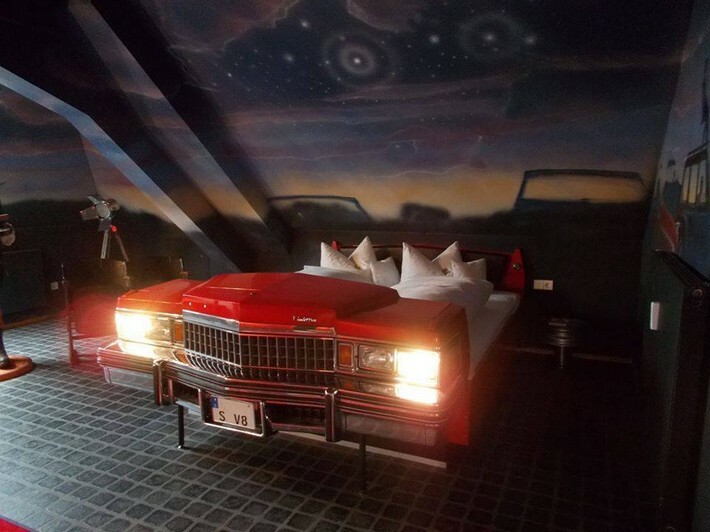 I mean this is great although, yet very astonishing to have a car look alike room bed, isn’t it crazy friends? This one is relatively easier among the rest of the ideas as here only the whole roof top of a vintage car is cut entirely and separated from the frame. And we have placed a thick glass top on this metallic frame turning it into a smart room table. Each and every article in this room is reflecting some great traits of art. 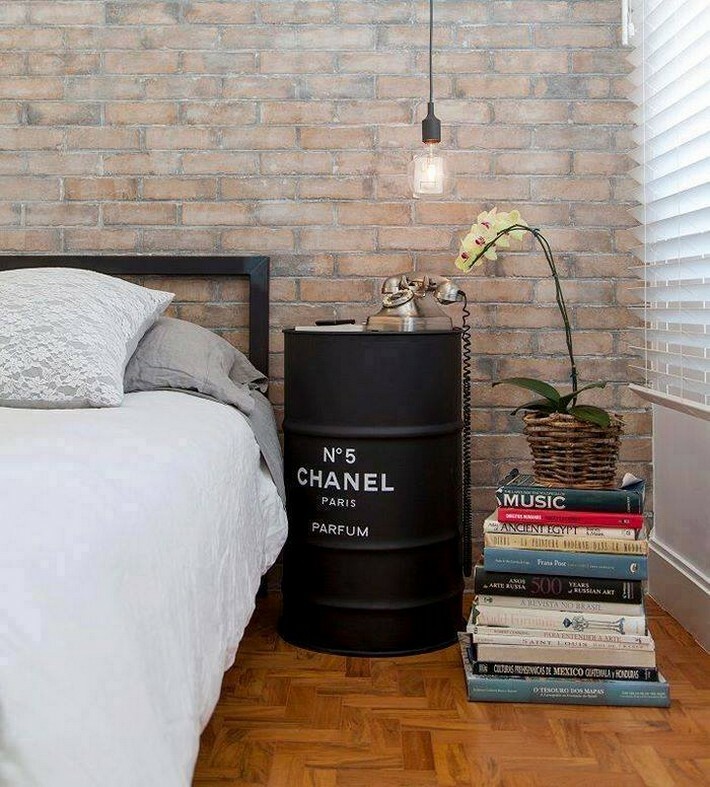 Like the accent wall is made with the plain bricks, headboard is made with straight metallic pipes, and the side table was made using the same metallic drum that we have already recycled a number of times. 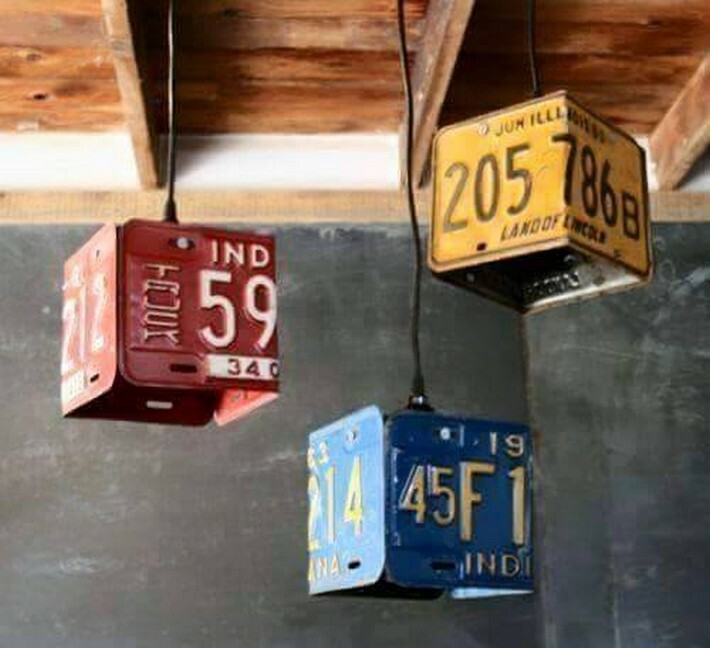 I know this kind of hanging lights or mini chandeliers can’t be installed inside the lavishly decorated houses. 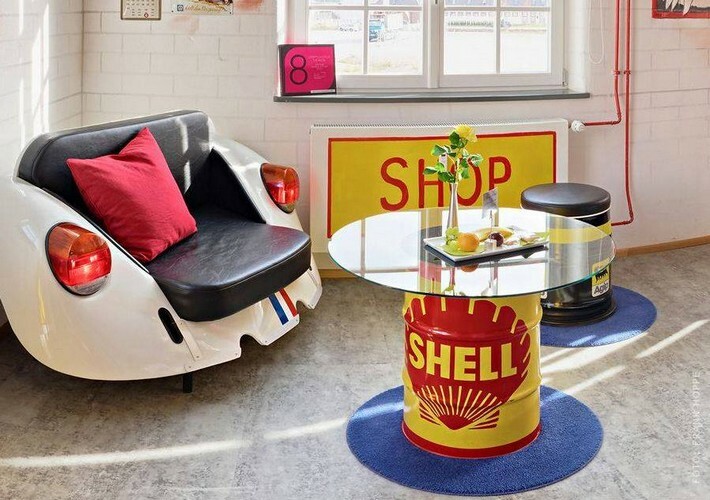 But they would just look perfect in some garages and workshops. As they are made by twisting the number plates and hanged with the metallic wires from the roof top. Again this one is a bit handy project because we no heavy cutting or drilling was needed in this specific plan. 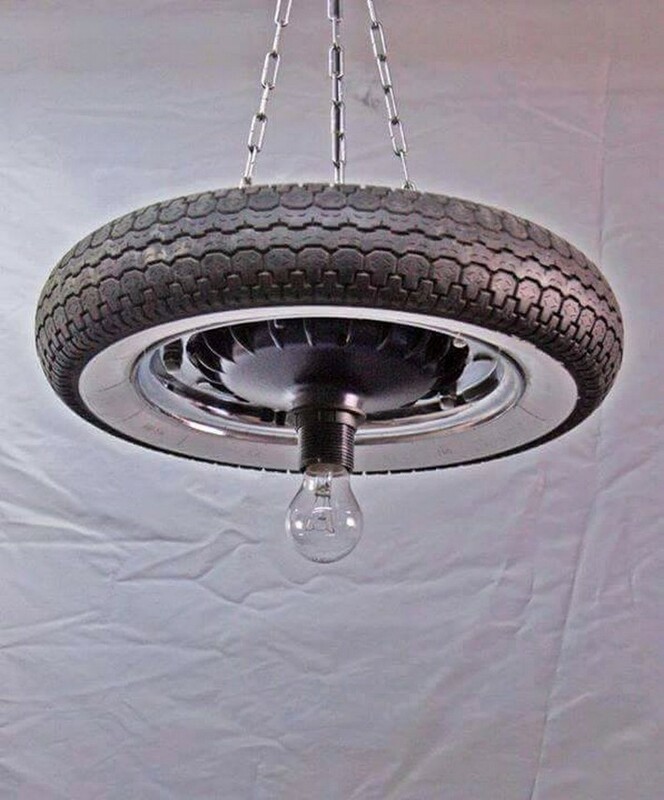 A whole tire along with the rim and the wheels cup is hanging from the roof top, and we simply installed an Edison bulb on the bottom of the tire making it an industrial chandelier. These couches cannot be bought from the market trust me as there you won’t find the crafters so smart like our team. Not only the shades are adorable but the art patterns on them are so fabulous that make them look like a perfect art craft. 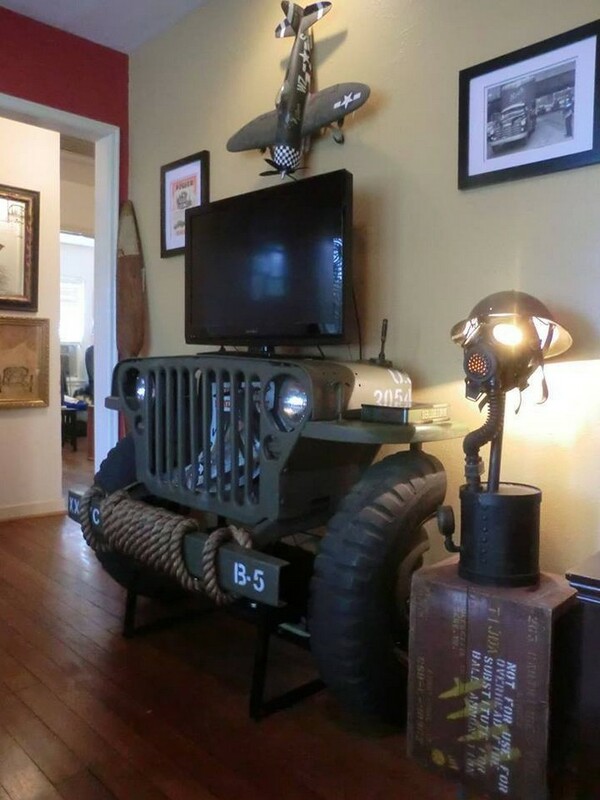 Forget about the wall shelves that we have had created with the shipping pallets. 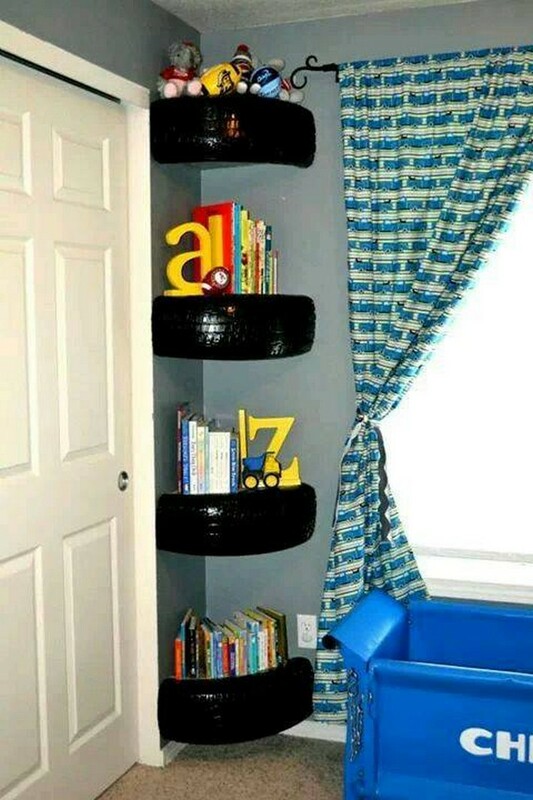 No doubt they are awesome and classy but if you have to go a step further and make some funky home project, try these old tires recycled wall shelves that look so incredible. Here we have literally disassembled a whole viable car in front of you guys. 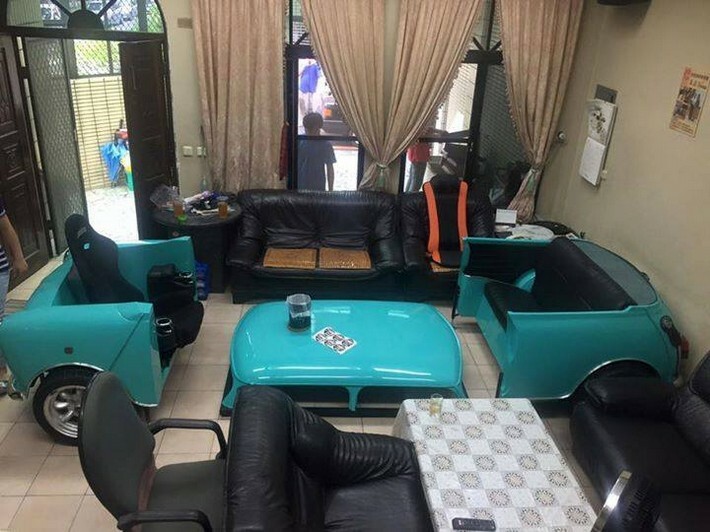 This seems like a whole comprehensive furniture range where a classic pair of couches along with a matching centre table. I am sure these are the real attention grabbers and each and every visitor is going to adore them. 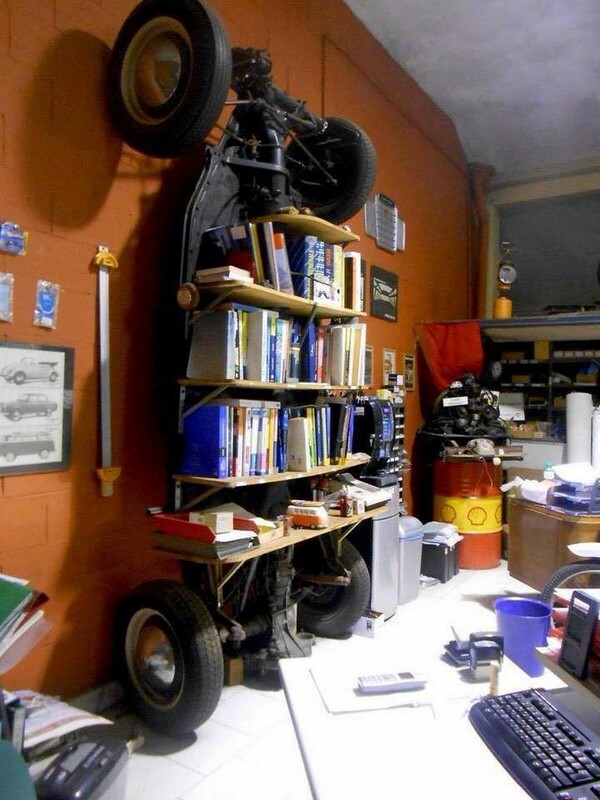 Even this whole wall book shelf was made with some random accessories like wooden pallet planks and ofcourse our main theme of the project, several parts of the car. 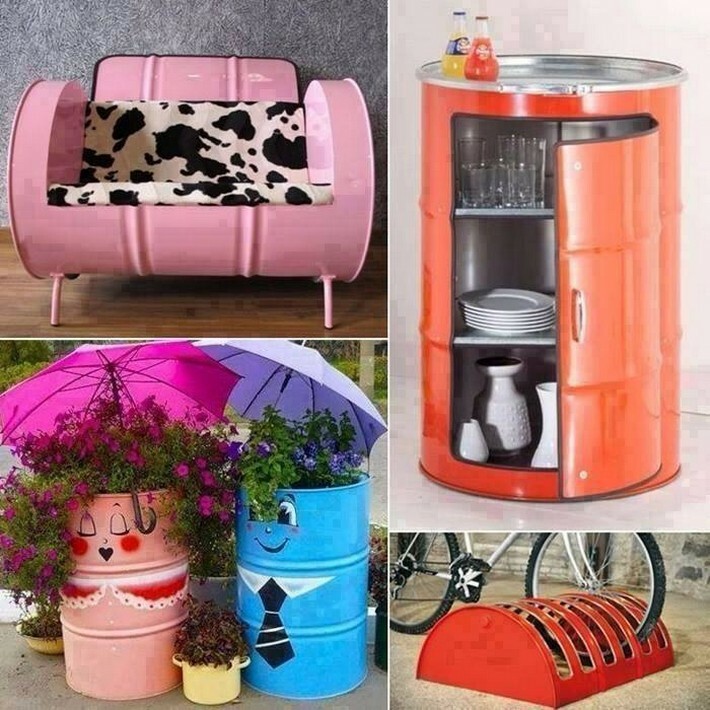 Plus we have also added a metallic barrel as a side table, all of these room accessories are purely made out of scrap and trashed items. 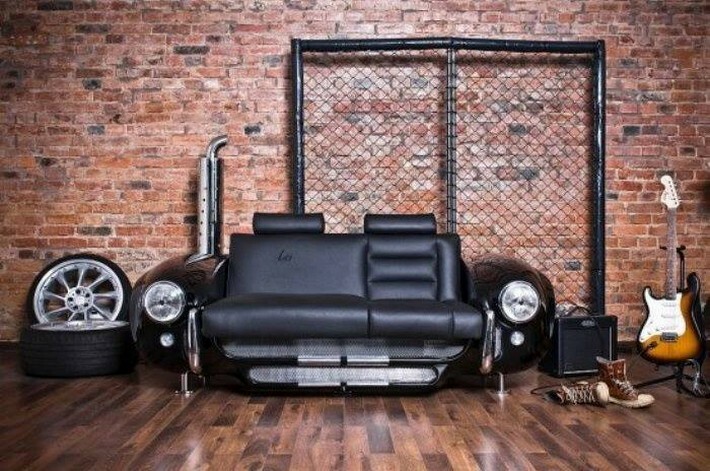 I think some cars loving persons or the ones having special affiliation with the machines would love this kind of furniture inspirations. 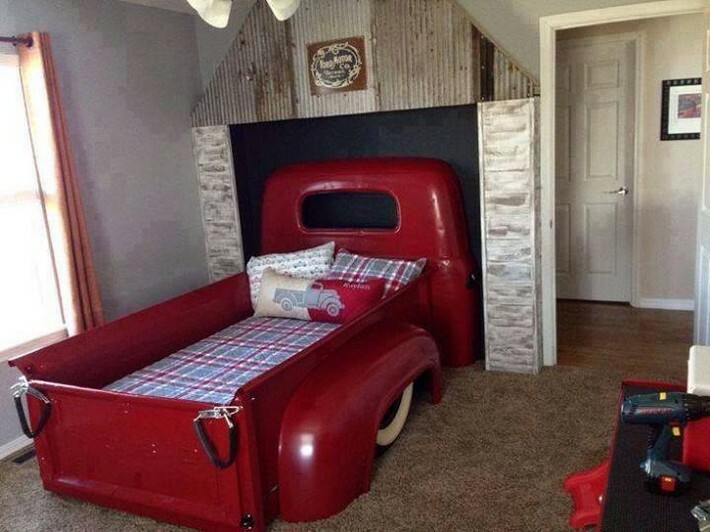 This room bed is a whole package of durability, style and essence of art. I am sure none of you is going to trash out your old car no matter how broken it is.